Chinatown has a wide range of places to buy foods. To prepare Chinese dishes, home chefs purchase ingredients at these stores and others. In Chinese cooking, a bowl of piping hot soup simmered for hours can be both nourishing and medicinal. This large store sells as wide range of dried foods including dates, fat choy, and fish stomach, said to soften facial skin. Chinatown resident Qiu Ping Guan prefers shopping in Chinatown as opposed to a supermarket. “There are more stores in Chinatown so you have the option of comparing goods.” Dai Lee Food Inc. stocks a variety of foods for traditional Chinese dishes including chicken, shrimp and glass noodles, rice dumpling flour for tong yun rice ball desert tong yun, a dessert whose name suggests unity, perfection, and completeness, and stir fried vegetables, that represent the liveliness and good feelings that come with the New Year. This stores sells a range of fruits and vegetables. For the new year, people purchase gifts, plants, and decorations as symbols of wealth, luck, and happiness. People buy oranges, a popular symbol of good luck which can also represent happiness and abundance, as in an abundant harvest. “For Chinese New Year dinner, we like to cook fish,” Chinatown Gui Fang Zeng she explains. “Fish is associated with the Chinese saying, nien nien you yu, ‘every year there is something left over’ (you never run out). Similarly, we also like to cook shrimp because it means that from the start of the year to the end of the year, everyone in the family is laughing throughout.” This store sells fresh whole fish with the tail and head still intact, as the body of the fish represents family unity or togetherness. Shoppers can also get live rock cod at Luen Fat Fish Market on 1135 Stockton Street. MING MING STORE is one place to behold a wide variety of Chinese candies, dried fruits, snacks, and grocery items. 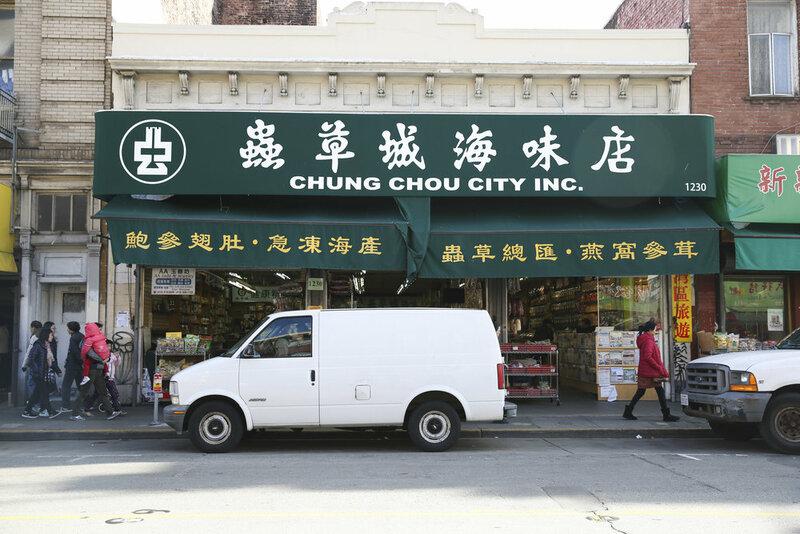 Before Asian supermarkets opened up throughout the Bay Area, Chinatowns were one of few places to buy Asian snacks and candies. Many Chinese Americans have fond memories of eating chewy white rabbit candies, sweet nickel-sized wafers called haw flakes, and salted plums or mui and olives or lomm. Mui have a special place in people’s hearts, particularly those who witnessed in Guangzhou vendors dressed as clowns in rooster costumes, tossing brightly-wrapped mui up three stories in the air to customers waiting in their windows. Ming Lee Trading Company sells dried fruits and candies includes tung gwa tong, a winter melon candy, and chun guang, a classic coconut hard candy. Chinese tradition calls for eating dried fruits and seeds as they symbolized wealth, long life and family. During the lunar New Year, families display eight-sided trays with traditional seeds and fruits such as preserved kumquats, plums, sweet melon pieces, sugared coconut slices, red dates, and red-colored melon seeds. During the lunar New Year, visiting guests are offered this tray, called a chuen hop, which is a homonym for "everyone gathered together" and/or "everyone in harmony." If young kids in the family serve this tray, they are sure to receive a lai see or lucky money.